Chris Helenius was born and raised in San Francisco. After graduating from UC Berkeley Chris attended the University of Santa Clara law school and graduated in 1976. He was a law clerk on the Supreme Court of California and then moved to San Luis Obispo where he practiced law for thirty years and eventually became a partner with the firm of Burke, Smith, Helenius & Hayes. During his career he tried over ninety jury trials and many court trials and binding arbitrations. Chris is a long-time member of the American Board of Trial Advocates and was the state chairman of that organization’s board. As a local community advocate, Chris served as the President of the Board of the Avila Beach Community Services District for eight years, and is a member of the board of directors of the Santa Maria Valley Water Users Association. Chris retired from actively practicing law in 2004, but kept his license to practice and continues to pursue his legal education. Chris supports many nonprofits including Sierra Club, Natural Resources Defense Council, Nature Conservancy and Planned Parenthood. 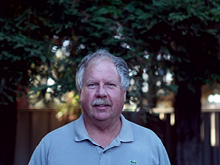 He joined the Board of The Land Conservancy of San Luis Obispo County in 2012. Chris and his wife, Lynn Marie, have two children, Marcus and Mikko. His family own ranch and farm property in California which all the generations of family remain deeply attached to. Chris is a lifelong sailor, skier, backpacker and traveler. He successfully competed in a sailboat race in the Bay of Islands, New Zealand and has been to over ninety-five countries around the planet.